In the 2006 documentary "Who Killed the Electric Car?" former head of the Tennessee Valley Authority B. David Freeman mentions a scheduled race from Gatlinsburg to Nashville with Paul Newman vs. Robert Redford. Sadly the race never happened. In May 2000, a truck en route from So. California to Portland, Oregon was stolen - it was carrying salad dressings of different varieties. The truck was later recovered and all but one brand was there... apparently the thieves had a penchant for the Newman's Own brand including the 664 cases of Olive Oil & Vinegar, 238 cases of Balsamic Vinagrette, and 344 cases of Family Recipe Italian. Paul commented: "To be chosen and bought is one thing, to be stolen before all the others is a choice honor indeed. It's a great vote of confidence in our products, the other national brands of salad dressing must feel unwanted." Later, 4 cases of empty bottles were returned to a nearby recycling center. The November 1986 cover of Life Magazine featured Tom Cruise and Paul Newman for The Color of Money. Someone suggested that it was unfair to have the budding young starlet Cruise upside down so they decided to make 2 covers- in which Cruise is right side up for the west coast distribution and Newman for the east coast. PLN helped start First Artists production company, a "sort-of indie-film commune" of the 1970s with Sidney Poitier, Barbra Streisand, Dustin Hoffman and Steve McQueen. The idea was to forgo up-front money to make dream projects. Some of the titles released included: Streisand's A Star is Born (1976), Hoffman's Straight Time, and Newman's Life and Times of Judge Roy Bean and Pocket Money. Joanne Woodward was the first person to get a star on the infamous Hollywood Walk of Fame. Newman enlisted in the Navy in 1943. Education: Attended Kenyon (Ohio) College; Yale Drama School. Newman's first Broadway job was as an understudy in "Picnic," in 1953, where he and Woodward met. Newman and Woodward married on January 29th, 1958 in Las Vegas, 3 days after Newman's 33rd birthday. Most reports say they honeymooned in Paris, but the video "Life: Great Romances" claims they honeymooned at the Connaught Hotel in London. Newman's Kids: three daughters with Woodward - Elinor (Nell) who runs Newman's Own Organics in California, Melissa and Claire (Clea); three children with Witte - Susan, Stephanie and Scott, who died in 1978. Ever think Ryan O'Neal looks vaguely Newman-esque in Paper Moon? You might be interested to know that the role was originally inhabited by Paul and his daughter Nell Potts was to play Addie but he left the project when friend and director John Huston dropped out and was replaced by Peter Bogdanavitch. A link to learn more about Paul and Joanne's moons find out how compatible they really are. 1986, Paul bets a NY Post reporter who misinforms the public of his height. Later, Paul will go on WNBC Live at 5 with Liz Smith to dispute the reporter. In 1990 when Joanne earned her B.A. from Sarah Lawrence College, PLN was the commencement speaker. Oops! In 1995, when Newman was presenting the Oscar for Best Cinematography, he forgot to read the list of nominees. Winner James Toll (Legends of the Fall) announced the names of the other nominees during his speech to a big round of applause. Paul Newman is a relatively new band (1997) from Austin, Texas. But it's got nothing to do with the "Real Blue Eyes": They named the band after the bass player, Paul Newman. The name "Fig Newmans" (Newman's Own's brand of cookies) is a registered trademark of the Nabisco Company, maker of Fig Newtons. For Paul's 50th birthday, Robert Redford gave him a Porsche...one that had hit a telephone pole at 90 mph. It was delivered and placed in Newman's driveway with a big red bow on it. Newman countered and had the car compacted and moved over to Redford's vestibule. "Being at a junket is like being double parked at a whorehouse." Paul Newman, referenced in documentary "Junket Whore"
Doris Day has an auction for AO for A, Paul Newman's PJ's from The Sting were auctioned off. "When I told Paul that his pajamas had been bid on for $60, he said, 'That's nice, but I didn't wear pajamas in The Sting, I slept in my underwear." Newman on his craft: "Acting is a question of absorbing other people's personalities and adding some of your own experience." "Acting isn't really a creative profession. It's an interpretative one." "Show me a good loser and I will show you a loser." Why he settled in Connecticut: "Better than Montana ... and my wife and I found a nice cemetery here." Asked about a rumored run for U.S. Senate in 1987: "I'm happy to issue a denial for something I never intended to do." 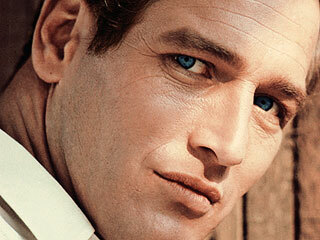 Newman's own suggested epitaph: "Here lies Paul Newman, who died a flop because his eyes turned brown." "On anyone else those box-shaped poplin suits look like crap. You put them on [Newman] and they look like Armani." Director-writer Ron Shelton on why it was nearly impossible to make Newman look scruffy for his role as Earl K. Long in the 1989 movie Blaze. "Top Ten Least Popular Paul Newman Products"
9. Combination salad dressing and racing oil. 5. Peanut butter with fleas. 3. Chapstick with super glue. 2. Newman's own super-tight underpants.